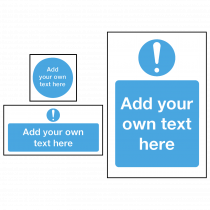 If you cannot find the catering safety sign you need or you require a specific safety sign for your kitchen, we offer you the option to create your own safety sign with our easy to use create a sign. 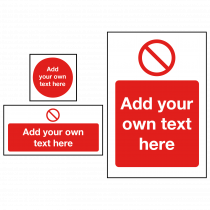 Simply select the type of safety sign, mandatory safety sign, warning or hazard safety sign, prohibition safety sign and choose your size and style options. We will choose a suitable safety sign symbol for your message, type in your safety message and add the quantity required. Delivered within 2 to 3 days from order. Please note: all notices printed on self-adhesive vinyl for easy application to tiles, fridges and most kitchen surfaces, and can be wiped clean with a damp cloth. 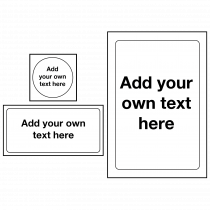 For non-specific - General Information - white background, black text. Should you require a large quantity of the same safety sign. 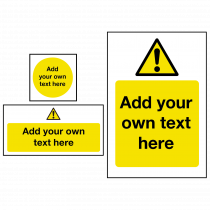 We offer bulk pricing on all our range of custom made safety signs. Email support@catersigns.co.uk or call 01173 326645 with your safety sign requirements for a quotation.